“Join the magic pen on a journey through the imagination and its stories. Wallace Edwards’ Once Upon a Line is the ultimate springboard to story writing for individual readers or for whole class endeavours. Starter sentences combined with beautifully illustrated colour pictures of a possible story line are set out on each page, where the only limit is the individual’s imagination. This is a fabulous tool for teaching creative writing, from brainstorming through process writing to illustration and publication. “…Edwards’ work is an educator’s delight as it offers countless instructional opportunities in storytelling, creative writing, and visual arts. Children will unquestionably enjoy the interactive nature of the book and how it openly invites them to make the stories their own. Perhaps most importantly, Once Upon a Line allows children to recognize that even the grandest of ideas often begins from something rather small. A wonderful addition to any classroom, school or home library, Once Upon a Line will most certainly appeal to a wide audience of readers for years to come. “Wallace Edwards has done it again! The introduction to Once Upon a Line lets us know that the fantastical paintings in this book were created by Great-Uncle George using an enchanted pen from the East. He only had to draw a single curving line, and it would turn into a painting. 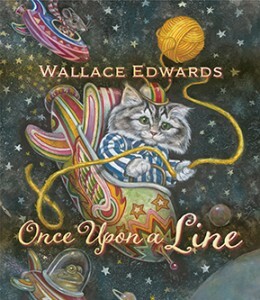 Each page has an illustration incorporating that line and a start to a story, beginning with ‘Once upon a line,’ an obvious and intriguing reference to ‘Once upon a time.’ As with his other books, Edwards creates many levels of meaning by combining all that you see on the page in unexpected ways. Although each page has its own theme, there are a few where connections are made to the previous illustration. At the back of the book is a guide showing where the magical line is in each of the pictures, and a reminder that the enchanted pen is also in each one, too. “What did you like about the book? This book consists of a series of colorful and whimsical illustrations accompanied by a few lines of text that serve as story starters. All begin with ‘Once Upon a Line’ and most involve animals. For instance one painting depicts a pig in a suit atop a very large fish: ‘Once upon a line, a fisherman tried out his new fishing pole. He was admiring the fine workmanship when suddenly…’ The book begins by saying that the paintings were found in an old trunk belonging to a magician and that ‘each picture starts with the same pen line.’ Most readers will find it very difficult to find the same pen line in each drawing, but there is an answer key at the end. This is a book that would be useful for aspiring writers. Anything you didn’t like about it? / To whom would you recommend this book? This would be a good book to use with a creative writing class. Children who like to write stories will enjoy the ‘story starters.’ Pair it with The Mysteries of Harris Burdick by Chris Van Allsburg.